A team of researchers working at The University of Manchester have demonstrated new possibilities for observing nanomaterials in liquids by building a graphene ‘petri-dish’. New two-dimensional (2D) nanomaterials possess the potential to enhance efficiencies, decrease costs, and provide better performance in a wide range of applications including; understanding the degradation of battery materials or better design of nanomaterials for batteries so as to enhance their performance. The unique properties displayed by 2D materials could also result in functional and antibacterial coatings, targeted drug delivery and bio-analysis. However, the difficulty of regulating growth and degradation at the atomic scale is presently an obstacle to fully making use of the potential of these sensational materials. Scanning/transmission electron microscopy (S/TEM) is one of only few methods that allows imaging and analysis of separate atoms. However, the S/TEM instrument needs a high vacuum to shield the electron source and to stop electron scattering from molecular interactions. A number of high profile studies have earlier exposed that the structure of functional materials at room temperature in a vacuum can be considerably different from that in their normal liquid environment. This could be like attempting to explore the structure of a dehydrated prune to comprehend the structure of the original plum. A research team led by Dr Sarah Haigh and Dr Roman Gorbachev at the National Graphene Institute and the School of Materials at The University of Manchester has demonstrated that graphene and boron nitride can be integrated to develop an ideal nano petri-dish. Liquid samples within the dish can be imaged with single atom sensitivity and it is also possible to measure their elemental composition at the nanometer length scale. Their work has been reported in Nano Letters. These engineered graphene liquid cells (EGLC) are constructed from 2D material-building blocks: they consist of a boron nitride (BN) spacer drilled with holes (where the liquid is contained) and compressed with graphene on both sides. The researchers also showed that these new graphene liquid cells enable an order of magnitude improvement in the quality of elemental investigation in liquid cells. 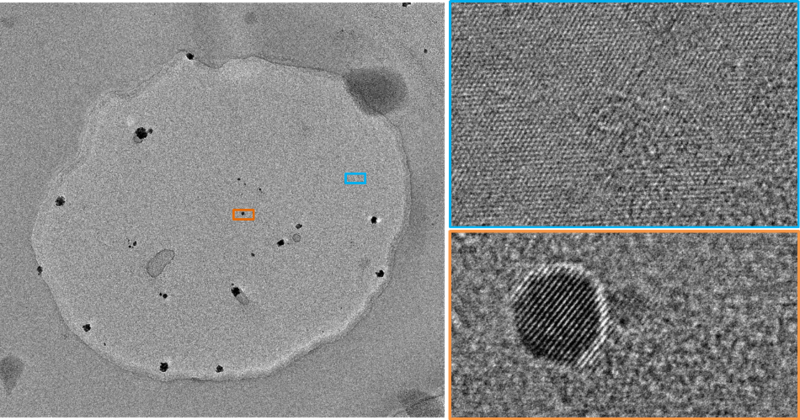 They examined the deposition of a 1 nm shell of iron on gold to grow core-shell nanoparticles. This new ability to track tiny concentrations over such small length-scales is a requirement for the growingly complex chemical structures of high-performing nanocatalysts.